This article outlines the steps for transferring a domain registration. It is relevant for transfers both to Media Temple and away from Media Temple. Media Temple is able to register or accept transfers for .com, .org, .net, .info, .biz, .co, and .me domain names only. 1. Check on the status of the domain to be transferred. It must be unlocked with the current (losing)registrar. It must be at least 60 days past the registration date or last transfer with the losing registrar. You may be able to do a transfer closer to your renewal date, but Media Temple has no control over how quickly Wild West Domains (our affiliated registrar) will process your transfer request, and it is known to sometimes take more than a week. If Media Temple is the losing registrar, you can administrate your domain locking from the Account Center. 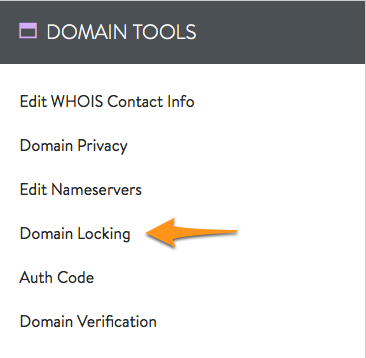 Click on that domain, then select Domain Locking from the Domain Tools menu. 2. Double-check that the listed administrative contact email for the domain is valid and functional. Turn off WHOIS information privacy if it is currently turned on. You can find the listed administrative contact email by checking your WHOIS information. 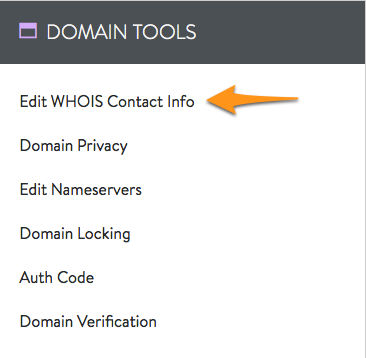 If Media Temple is the losing registrar, click on your domain in the Account Center, then select Edit WHOIS Contact Info from the Domain Tools menu. 3. You must obtain your authorization code from the losing registrar (sometimes called the EPP code). You must enter this code via the method specified in the transfer email you receive. If Media Temple is the losing registrar, you can obtain your authorization code in the Account Center. 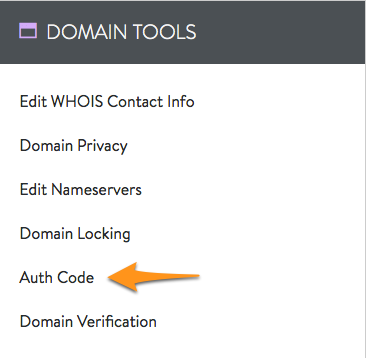 Click on your domain, then select Auth Code from the Domain Tools menu. Then, click on Email Auth Code to email it to the administrative contact. Start your transfer request with the winning registrar. The winning registrar will then initiate a transfer request to the losing registrar. If Media Temple is the winning registrar, you can start a transfer request through the Account Center. 1. Select the Domains menu. 2. Select Add New Domain or Service. 3. 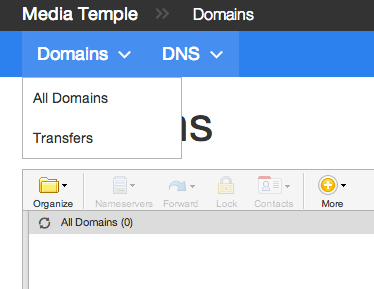 Under the Add Domains section, navigate to Transfer Registration and click the Transfer Domain button. 4. Type in your domain name. Select whether you want to add another server or not. Then, click the Use This Domain button. 5. Select which hosting service you want to point the domain toward. Click Next Step. You may get a warning about the MX record. Read the warning, select the checkbox, and click Next Step. 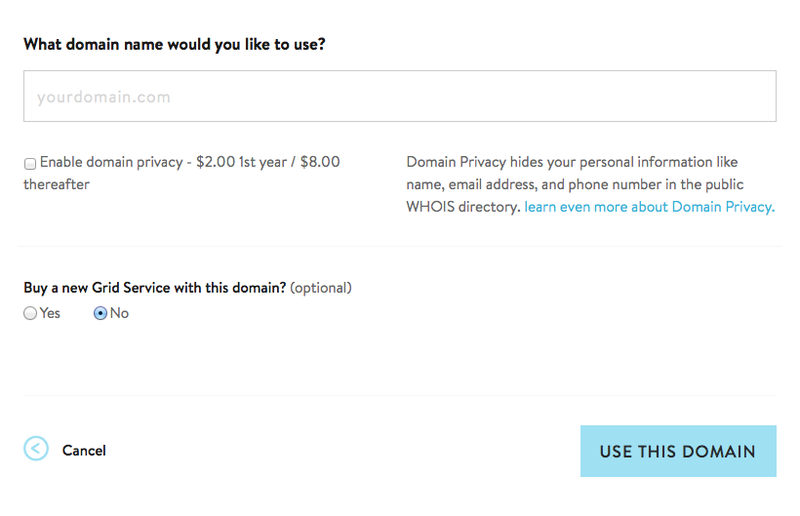 If you are already hosting the domain on a server, be sure to click the Don't modify DNS button. 6. Approve the charges and complete your purchase. The winning registrar sends an email to the administrative contact email address listed in the WHOIS information for the domain. 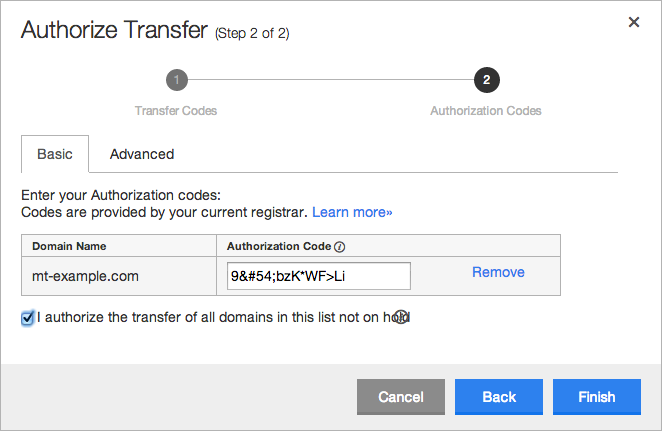 If you are transferring a domain to Media Temple, you will need to complete a transfer verification process through your Account Center to complete the transfer. This process involves a login to a separate Securepaynet control panel to verify the transfer, per the steps below. 1. First, log into the Account Center and select the domain you wish to transfer to Media Temple. 2. 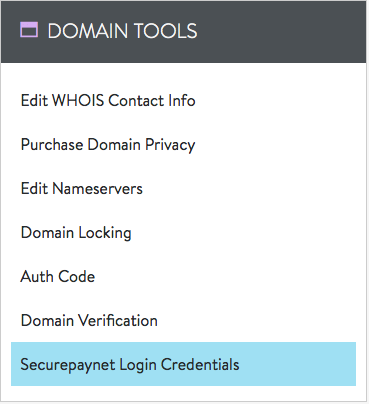 Next, look for the DOMAIN TOOLS box click on the "Securepaynet Login Credentials" button. 3. You will need to use these credentials to log in. Keep them handy and click the "here" link to proceed (or use the URL provided in the transfer email). 4. Log into the Securepaynet Control Panel. 5. From the Securepaynet control panel, navigate to the Domains tab, and select Transfers. 6. Your domain will show under the Pending Transfers In section. Select Authorization code needed to proceed. 7. Next, you will need to enter the domain authorization code (also sometimes called an EPP Code) obtained from the losing registrar in Step 3. After providing your authorization code, select Finish to continue. Once all credentials have been entered correctly, the transfer status will change to "Processing. No action needed." To complete the transfer, an ICANN-mandated domain validation will be required after the domain transfer credentials have been entered. You will receive an email sent to the address listed on the WHOIS record for the Owner contact. Your domain transfer may take up to two weeks to be processed by Wild West Domains. Usually, it does not take that long, but it is a good idea to allow for that much time. At the end of the transfer process, your winning registrar will be your official new registrar. Please remember to close your account or any associated services that you may no longer need. This includes domain registration renewals. You will not be able to make any changes to your WHOIS or DNS information during a transfer, so it's a good idea to make those changes first. Transferring your domain registration will NOT update your nameservers, so if you are planning to change hosts, you should update your nameservers before starting the registration transfer. If your registration expires with the losing registrar before the transfer is completed, you will need to renew with the losing registrar. You must then wait 60 days before attempting another transfer. A Media Temple registration transfer request will remain active for five days. If you need the transfer request re-sent for any reason, wait five days and then contact Media Temple support to get your transfer re-initiated, at no additional cost.